Cartoons follow the adventures of imaginative young Calvin and his stuffed tiger, Hobbes, as they cope with bullies, babysitters, and the other everyday problems of growing up. Calvin and Hobbes was a daily comic strip written and illustrated by Bill Watterson, following the humorous antics of Calvin, an imaginative six-year-old boy, and Hobbes, his energetic and sardonic—albeit stuffed—tiger. Syndicated from November 18, 1985 until December 31, 1995, at its height Calvin and Hobbes was carried by over 2,400 newspapers worldwide. 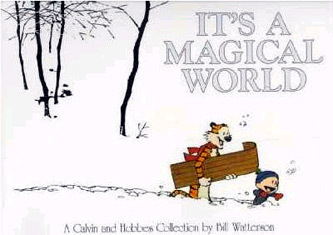 To date, more than 30 million copies of 18 Calvin and Hobbes books have been printed. The strip is vaguely set in the contemporary Midwestern United States, in the outskirts of suburbia (West 1989). 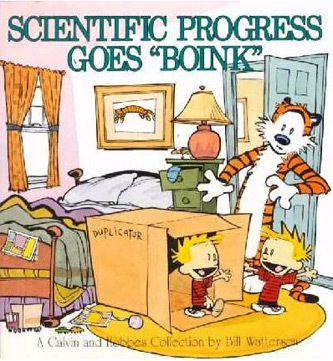 Calvin and Hobbes themselves appear in most of the strips, though several have focused instead upon Calvin's family. 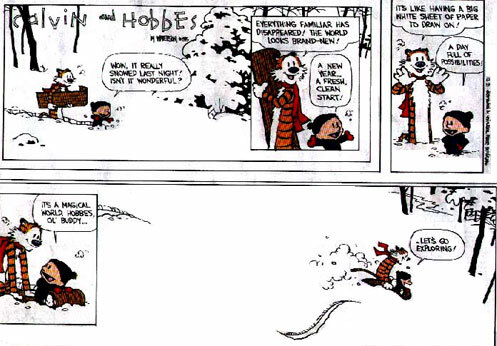 The broad themes of the strip deal with Calvin's flights of fantasy, his friendship with Hobbes, his misadventures, his views on a diverse range of political and cultural issues and his relationships and interactions with his parents, classmates, educators, and other members of society. 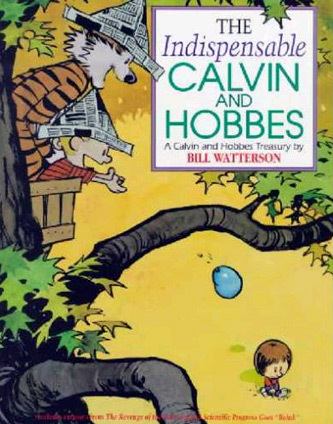 The dual nature of Hobbes is also a recurring motif; Calvin sees Hobbes as alive, while other characters see him as a stuffed animal, a point discussed more fully below. Unlike political strips such as Garry Trudeau's Doonesbury, the series doesn't mention specific political figures, but it does examine broad issues like environmentalism and the flaws of opinion polls (Astor 1989). 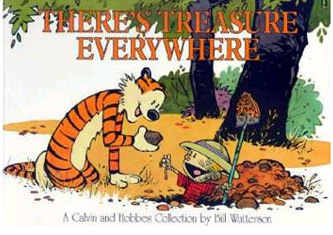 Because of Watterson's strong anti-merchandising sentiments (Dean 1987) and his reluctance to return to the spotlight, almost no legitimate Calvin and Hobbes licensed material exists outside of the book collections, but collectors do collect items that were officially approved for marketing purposes. Two notable exceptions to the licensing embargo were the publication of two 16-month wall calendars and the textbook Teaching with Calvin and Hobbes. However, the strip's immense popularity has led to the appearance of various "bootleg" items, including T-shirts, keychains, bumper stickers, and window decals, often including obscene language or references wholly uncharacteristic of the whimsical spirit of Watterson's work. The end of 1995 also meant the end of an era for comic strips. Sunday morning papers carried the final installment of the popular comic strip "Calvin and Hobbes." After years spent chronicling the misadventures of a boy and his stuffed tiger, cartoonist Bill Watterson has put down his pen to seek other challenges. Calvin's final words to his faithful friend Hobbes are "Let's go exploring!" The award-winning cartoonist details the further adventures of Calvin, a mischievous young boy with boundless energy and imagination, and his lovable stuffed tiger. 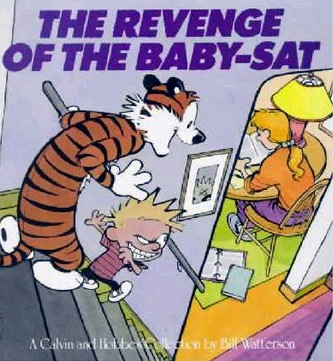 Features the hyperimaginative six-year-old and his guardian tiger in their most memorable adventures from Revenge of the Baby-Sat and Scientific Progress Goes Boink. 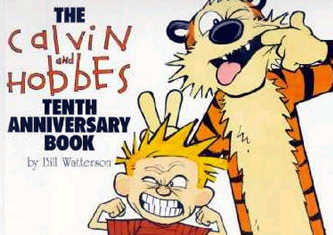 The creator of Calvin and Hobbes discusses the art of cartooning, explains how he creates his popular comic strip, and presents his favorite moments from the series ten years. 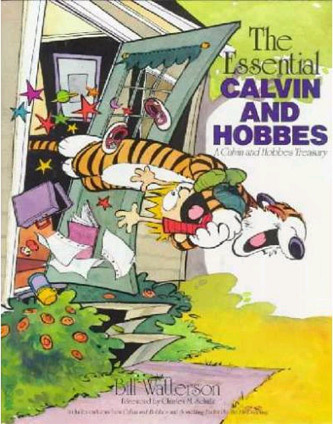 The best of the popular comic strip collected in one volume follows the rambunctious adventures of six-year-old Calvin and his tiger Hobbes. The popular comic-strip duo roam their many worlds in search of treasure and adventure, approaching warp speed, fighting off killer bicycles, conducting dad polls, and creating legions of snowmen and other not-so-alien beings.